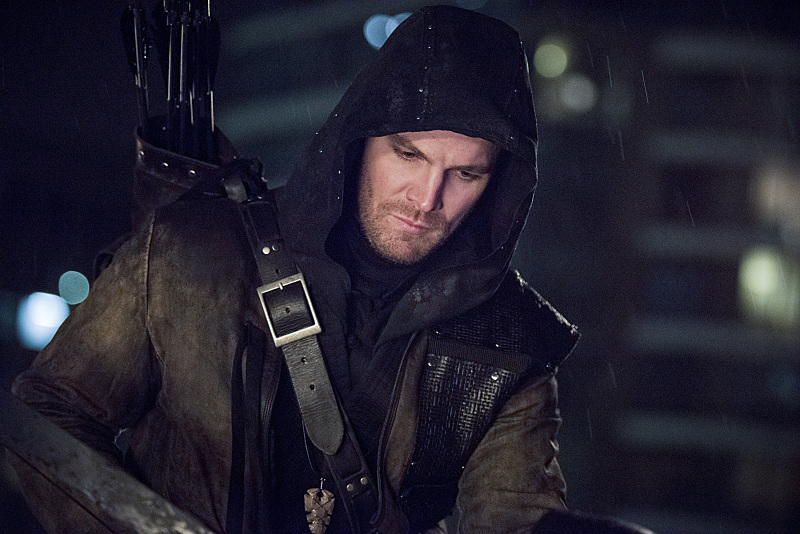 We have a new show opening where instead of My Name is Oliver Queen, we get my name was Oliver Queen. Three weeks have passed and we see Oliver going through some rigorous League training. One of Oliver or Al-Sah-Him’s final test is to see if he has the balls to kill a friend and that grind happens to be Diggle. The two engage in a sword fight and Al-Sah-Him kills him. But it isn’t Diggle. Ra’s gave Al-Sah-Him a drug that causes him to hallucinate. During a walk, Ra’s tells a story of how he first came to Nanda Parbat with a man called Damian Dark. When Ra’s was named the heir Damien didn’t take it so well and left. Apparently, Damien tried to buy Malcolm’s earthquake machine and started HIVE. Something tells me that Damien is the big bad for season 4. The alpha omega has been released and the people at a night market in along among are dropping like flies. Maseo and Tatsu want to make their way back to Akio. In the morning, Oliver, Maseo and Tatsu, who are okay because they inoculated themselves, see the U.S. Military supposedly giving out a cure the trio knows they just spreading the virus around so they take out the soldiers and then blow up the truck. Maseo, Tatsu and Oliver return to the apartment to find the babysitter dead but Akio is okay. As the group flees Hong Kong, Tastu notices that her son’s mouth stars to to fill with blood. Meanwhile back in Starling City, the Black Canary is taking on a mugger and is doing okay but gets caught off guard by a hidden knife. Nysa subdues the guy and let’s Laurel know she let down her guard. Laurel wants to take a break from the training and suggests the two golfer burger and fries. Laurel notes how happy Alyssa seems to be but the good mood is short lived when Laurel mentions that Oliver took up Ra’s offer and is now Heir to the demon. Nysa is upset for Laurel keeping this from her and leaves. At the Diggles, Felicity and Thea are over when Diggle comes back from stopping a weapons deal. Thea talks about missing her brother and feels she has no family,left. Lyla tells Thea that she is welcomed anytime. Diggle then toasts Oliver to say that she is gone but not forgotten. Laurel goes to Nyssa’s hideout to apologize but Nyssa says that she knows what is going to happen. the League is going to come and kill her. Lo and behold we see Al-Sah-Him arrive with his League soldiers. In the new Arrow Cave (Ray’s lab in Palmer Technologies) Nyssa tells Team Arrow the score and the Oliver that then knew is gone as he went through some League ritual to get the Oliver Queen out him. Diggle and Felicity refuse to believe that Oliver could be brainwashed but reluctantly help Nyssa. 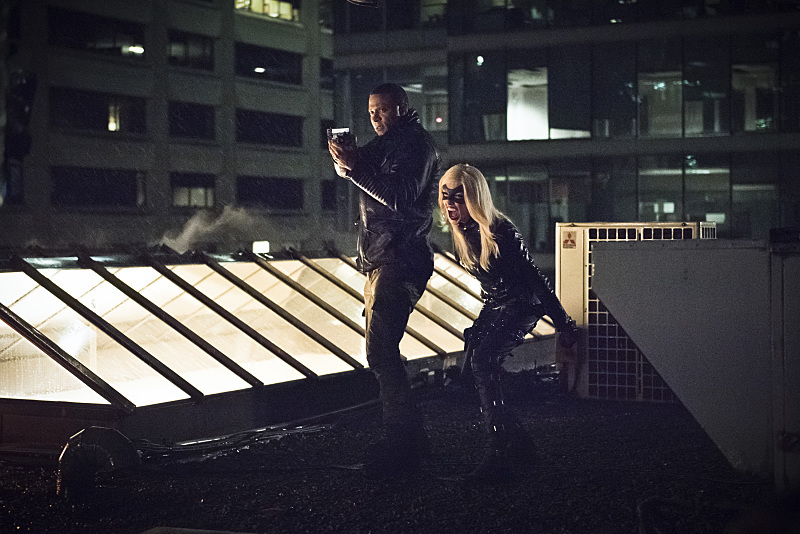 Thanks to a tracker that Laurel put on Nyssa we see that she is on the same rooftop where Sara died. Nyssa and Al-Sah-Him engage in a fight. Just as Al-Sah-Him is about to deal a death blow, Laurel unleashes her canary cry that saves Nyssa but allows Al-Sah-Him to escape. Felicity was watching this whole scene and when a Team Arrow returns to the Arrow lab, they come to grips the Oliver they knew is dead. When Al-Sah-Him returns to his League hideout in Starling City he tells Maseo that they need something to lure out Nyssa again. At the Arrow Lab, Thea drops by to see Felicity. Thea wants to help out and there is a point in this conversation where Thea calls Diggle, Mr. Diggle, which I think is sweet. But Felicity doesn’t think it is a good idea that Thea join Team Arrow as Oliver made the deal to ensure Thea’s safety. So Thea turns to Malcolm for help. To lure Nyssa out, Al-Sah-Him kidnaps Lyla, who wonders what happened to Diggle” best friend, the man that gave him purpose. Al-Sah-Him calls Diggle nothing will happen to Lyla as long as get brings Nyssa to a specific address within 30 min. Diggle goes to Nyssa and is ready to throw her to wolves to save his wife. Laurel is against this as there is a way for them to save both. When Team Arrow arrive with Nyssa at this location, the League pats down everyone except Felicity for weapons. Al-Sah-Him lets Lyla goes who hugs Diggle then Felicity who hands her two guns that she uses to kill two League members. A fight ensues where Laurel fights League members and holding her own, Nyssa is fighting Maseo while Diggle and Al-Sah-Him face off. Al-Sah-Him is about to kill Diggle when Thea aka Speedy shoots an arrow through her brother’s arm where he stands down but he escapes with Nyssa. Team Arrow assembles back at the Arrow Lab to say that while Oliver is gone what remains is them and Diggle vows they will continue to save Starling City. At Thea’s loft, Felicity comforts Thea, who didn’t realize that our favourite IT and her brother were an item. Felicity does manage to cheer Thea up to say that Roy is actually alive and gives her his address. There is a montage of Team Arrow dealing with the loss of Oliver to the League. At Nanda Parbat, Ra’s tells a tale of how Nyssa used to hide things as a child and manages to find the vial that Nyssa hid in the hilt of her sword. Just when it looks like Al-Sah-Him is going to kill Nyssa, Ra’s stops him to instead force a marriage between his heir and daughter to unite the bloodlines. Ra’s calls his daughter Bride to the Demon. Ra’s has one more thing to show Al-Sah-Him. But first Ra’s tells how his predecessor eradicated his hometown to shed his formal life. Ra’s reveals the vial that Nyssa had is the alpha-omega bio weapon and he wants Al-Sah-Him to unleash it on Starling City. I said this on Twitter but how much can one city take in three years? First an a earthquake. Then super soldiers and now bio weapon. I am wondering if the population of Starling City goes down every year. Let’s what happens next week.